Analyzing and compiling large datasets is one of the fundamental principles behind the development of computational systems that evolved into modern computers. But what happens when the datasets become so large or complex that traditional processing applications are inadequate? Such are the questions presented to Big Data scientists who are trying to disseminate the seemingly insurmountable glut of digital information. Nowhere has the big data push had a bigger impact than on the field of genomics. Understanding the key interactions between genes contained within the human genome and the subsequent proteins for which they code is critical to unlocking the functional roles of specific biomolecules in disease states. In order to address many of these genomic issues researchers from the Icahn School of Medicine at Mount Sinai and Princeton University have designed a new online tool that predicts the role of key proteins and genes in diseases of the human immune system. The online tool uses information compiled from 38,088 public experiments in order to predict new immune pathway interactions, mechanisms, and disease-associated genes. 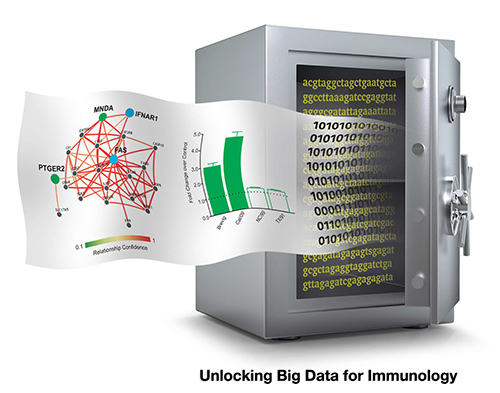 Due to advances in computing power and storage, combined with sharp declines in technology prices, big data researchers are able to combine more powerful algorithms and models into tools such as ImmunNet—which can pull previously unidentified disease patterns from databases. ImmuNet enables immunology researchers without special computational training to use the statistical techniques of Bayesian data integration—an interpretation of statistical probability—and machine learning algorithms to “interrogate” this huge archive of public data. Analyses such as these are able to detect relevant information among the sea of often-conflicting data obtained from diverse experiments. Additionally, Bayesian analysis is able to discern only those datasets that provide new insight about a pathway of interest while excluding datasets that are not relevant to the targeted pathway. The researchers stressed that one of the main goals of ImmuNet is to advance the understanding of the immune system, the network of cells and organs that protects the body against infections and cancer.